What Does Abomination Mean When Used In The Bible? Most people understand that when the word abomination is used it means something bad. However, most people could not define abomination if asked. Unfortunately, the current trend to redefine marriage by the courts has led to an increase in the emotionally charged use of the word abomination by some Christians to describe alternative definitions of marriage. For this reason, as Christians, we should know what does abomination mean when used in the Bible? What is the common definition of the word abomination? Abomination is commonly defined as (1): 1. “a thing that causes disgust or hatred.” 2. “a feeling of hatred.” It comes from the root word “abominate” that historically is derived from the prefix “ab-”, which means “away” or “from” and the root word “omen”, which is an event that is regarded as a sign of good or evil. Together, the word abomination is used describe something that is a sign of evil and inspires hatred. How does the Bible use the word abomination? The first use of the word abomination is found in Genesis 43:32. In this passage of scripture, it is used to describe how the Egyptians felt about eating with Hebrews. Practically speaking, the Egyptians were repulsed with the idea of eating bread with foreigners because of their cultural differences. Other verses that communicate this idea of cultural conflict are Proverbs 29:27 and Psalms 88:8. In the New Testament, the word abomination is most often used to indicate a connection with the anti-Christ in prophecy (Daniel 9:27) and those who reject God (Matthew 24:15; Mark 13:14; Titus 1:16; Revelation 17: 4; Revelation 21:22-27). Elsewhere in the New Testament, the Greek word for abominable is translated as “unlawful” in Acts 10:28 when Peter described what happened when he went to a Gentile’s house (Acts 10:1-48). It was against the Mosaic Law for a Jew to visit with a Gentile and it initially caused trouble with the other disciples (Acts 11:1-3). Again, we see the idea of the clash of two cultures, which causes revulsion and hatred. Does the word abomination apply to anything today? When you consider that the word abomination suggests more than just a feeling about someone or something, it is important to understand that as Christians, things may be an abomination to us culturally. Likewise, it is interesting to note that people who get upset over the use of the word abomination are exhibiting the very signs that the word abomination is an abomination to them. Although most will deny it, culturally speaking no one can honestly admit that someone or something is not an abomination to them. However, in our politically correct society, the use of certain words upsets some people very highly. This is because some people do not want anyone to suggest to them that they are accountable to a holy God or are wrong. Ironically, the people who get the most upset are ones who are outspoken critics of Christians and ridicule anyone who believes in God or the truth of the Bible. Sadly, it makes one wonder how people who can claim to be so smart can get so offended over something they do not believe in. The Bible tells us that when you love God’s Word, nothing will offend you (See Psalms 119:165 in the KJV). Likewise, the Bible says that those who do not love one another do not love God (1 John 4:15-5:3). Therefore, it is reasonable to believe that those who do not share our same love for God might be offended. The word abomination is a perfectly reasonable word to use when describing things that deeply clash with our beliefs and all the things that we hold true as Christians. However, we should make every effort to communicate in ways that are edifying to others and do not give them cause to reject what we say based on how we said it (Ephesians 4:29-32; Romans 12:9-21). Likewise, our goal should be to communicate why we believe what we believe instead of arguing with someone and using inflammatory words that communicate condemnation for what they believe. Finally, we must understand that Jesus told us that people will mistreat us and we will suffer persecution for our beliefs (John 15:17-16:3). When He was yelled at, He did not yell back. When He suffered, He did not threaten those causing the suffering. But, instead He counted it a joy to suffer and die for us that we might have eternal life. Therefore, we must always use Christ as our example (1 Peter 2:18-25; Hebrews 12:1-2). The word abomination is a word that is used to describe a deeply held reaction to someone or something that is deeply disagreeable to our way of living or believing. 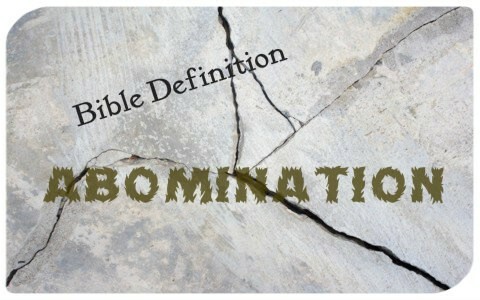 In the Bible, the word abomination is not only used in a cultural sense, it is used in a prophetic and spiritual sense. Therefore, the common misconception that the word abomination can be used as a substitute for the word hatred is wrong. An abomination speaks to the conflicts between men’s souls. Christians should use every opportunity to communicate in ways that will cause others to listen to the message the God has placed on our hearts. Here is another word defined in the Bible: How Does the Bible Define Courage? Thank you for defining this word for us. There are a lot of words, which are rarely used in modern society, that a lot of people may not understand their meaning. Previous post: What Was Manna In The Bible? Next post: Does The Bible Really Condone Stoning People To Death?